Why I Stamp One month! Random.Org has chosen comment #22 – Sandyh50 to receive one of my SAB sets!! Sandy I have emailed you. Let me know which set you would like and your address. I’ll get it in the mail to you asap!! I’ve decided to go ahead and give 2 sets away!! Number 2 on the Random.Org list is comment #82 – Kathy Hering!! Kathy as soon as Sandy lets me know which set she wants, I will email you with what is still available for you to choose from. Congrats ladies!! Hope you have fun with your stamps. Last month I received this darling card from my DDIL. Well it was from my son, too, but Kimberly made it. Isn’t it just the cutest! The stamp set used here is called “Unfrogettable” from Stampin’ Up!. One of my favorite blogs and stampers in the whole world is Sharon Johnson (notimetostamp). Every Friday Sharon has a “Stamp Simply” challenge on her blog. This week she has challenged us to use paper piercing. Well I have NEVER paper pierced before so decided to take some baby steps and give it a try. Can you see it! lol The flower made from the scallop punch is something I saw over on Beate Johns’ blog. Beate posted a scrapbook page that her friend Cheryl Simmons had done. I thought it was so cute and clever. Oh and one last thing. I wanted to mention about my new signature over there on the sidebar under my picture. Fun stuff! You can have one too. It’s free and you can check it out over at My Live Signature. This card is simply adorable. 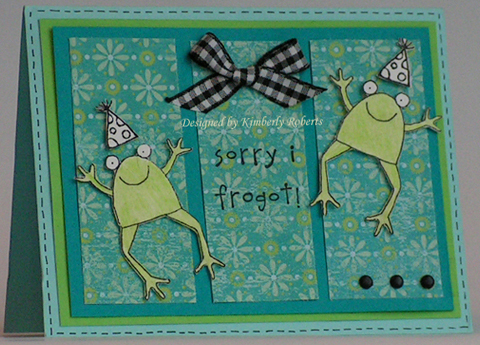 Love your cute frog card and you embossed card is so pretty and elegant. Great color combination. I really like that flower…will definitely have to give it a try. Cute card from you daughterinlaw… and I love the paper pierced card.. Nicely done!! I just love to see a new stamper getting started. She did a wonderful job–way better than any of my early attempts. Isn’t it great to have all this inspiration around us these days? The card you made is an absolute beauty! So sweet and simple but an absolute beauty! What a clever way to make a flower!!! I must try this with my scallop Nestabilities! Oh Susan, this is such a fresh and clean look! Absolutely love the mix of dotted swiss and gingham. The blossom is to die for! Off to Beate’s blog to check out the directions for the paper flower! TFS!! I really like those colors… what a pretty card! I am so proud of you! You did it! You piercings look great! Wait until you have that template. You won’t ever stop! Everything looks better with a little paper piercing!!!! Your Daughter In Laws card is so cute!! Love your card today too. I really like the clean look to this card! It’s fabulous! a beautiful card. I love the wonderful design and those piercings! Ooh, I just love this background, and the rest of the card isn’t too shabby either! I think you did a great job! Very fresh looking! I love Sharon’s challenges. This froggie card is just too cute, she has a lot of talent for sure!! I love the black accents, they just pop out at you and the birthday hats are too cute!! Happy Belated Birthday, I think!! Sharon is amazing, I love her blog too! Love your card with the swiss dots and the fabulous flower, so elegant and pretty!! Love your card – can’t believe it’s the first time you’ve paper pierced though, I probably use that TOO often! LOL! And your DDIL’s card is super adorable too! Kimberly’s froggie card is so cute!! Your card is sooo pretty!! 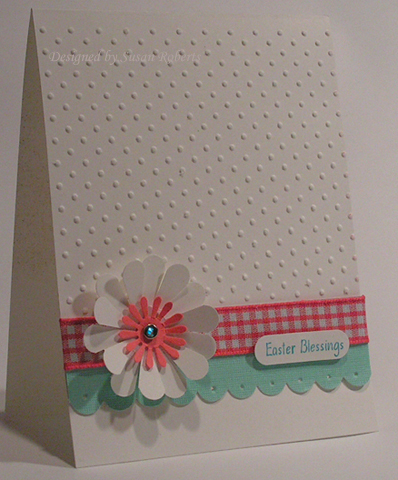 I love the polka dot embossing, and your flower turned out so beautiful!! Fantastic! !